ORIGINAL STRENGTH, FAST ABSORBING In Motion Hemp Pain Creme Lotion has 100 mg. of Hemp, derived from Organic Hempseed Oil; Inmotion is a Liposome Formula that allows the Creme to be absorbed very quickly. Also contains 2 essential oils (Boswellia Seratta & Cetyl Myristoleate) proven to reduce pain & inflammation. Inmotion also contains 2% Menthol, also proven effective in reducing pain. SAFE with NO SIDE EFFECTS Inmotion Pain Creme is Non GMO, and is Gluten Free. It is 100% Non Psychoactive, without the side effects often associated with Over the Counter and prescription pain medicine. 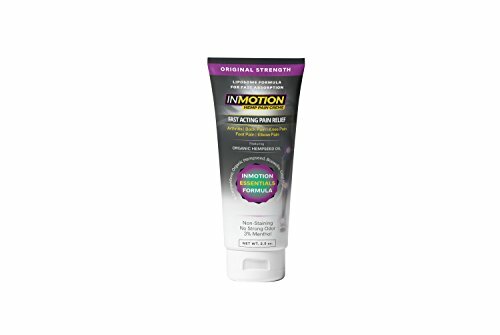 NO STRONG SMELL, DOES NOT STAIN CLOTHES Topical pain medicines are often known for their strong smell; when using Inmotion pain relief creme, people will not know you are using it. Plus, Inmotion absorbs so quickly, it does not stain clothes. HIGH PERFORMANCE PAIN RELIEF FOR ALL AGES Endorsed by Retired Quarterback Rodney Peete and Holly Robinson Peete (actress and Philanthropist); Rodney was given a tube of Inmotion by a friend, and to hear him tell the story, Inmotion helped him immensely with his recent knee replacement. The rest was history, and we came together to have Rodney and Holly be our spokespeople for Inmotion. Whether you are 90 years of age, or 6 years of age, Inmotion Pain Creme is safe for all ages (if pregnant check with your doctor first). Some women have noted it helps with menstrual cramps. It does not make you miraculous pain-free, but if you have a sports injury, try out your first hemp seeds extract products. 100% LEGAL - Many are worried when they hear a product is related to THC, Hemp, Cannabis, etc. However Inmotion is completely legal in all states. It's impossible to "get high' from the use of it. It will not show up on any urine test. It is non-psychoactive, and not addicting. It also won't give you the cravings or the "munchies." MADE FROM THE PUREST INGREDIENTS - 100mg of Hemp from 100% organic hempseed oil, along with 2 essential oils. Non GMO and Gluten Free. HOW TO USE - Apply a liberal amount to your problem area. For joints, massage in well completely around entire joint. Do not apply in a small dot sized area; the larger the area applied, the more effective the lotion becomes. If you have any questions about this product by InMotion Hemp, contact us by completing and submitting the form below. If you are looking for a specif part number, please include it with your message.